Swing thread is a must needed trimming which are significantly used in garments manufacturing. To make garments, sewing thread plays an important role in readymade garments sector. There are different types of swing thread which are mentioned in this article. Oldest sewing thread and was used at a wide range for sewing threads during making of garments. This type of sewing thread has high strength and slightly can make more strength of seam. Linen sewing thread was used at a large rate to sew canvas, course fabric and so on. But now it is mostly replaced by synthetic threads. This type of sewing thread is made from both continuous filament and broken filament silk. Comparatively it contains higher strength, extensive, lustrous and good qualities. 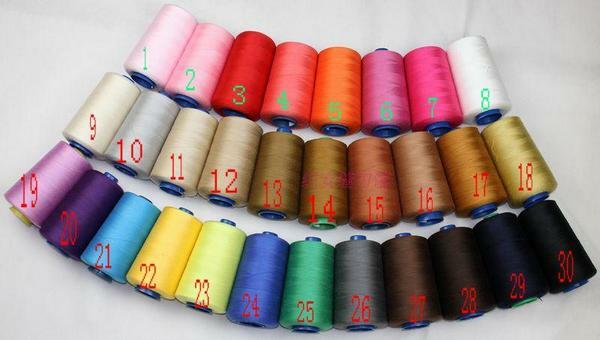 Silk sewing thread is most expensive, that is why using of it is comparatively less. It is used to sew expensive garments. Bleaching and dyeing have done in this type of sewing thread and sometimes lubricants are used to make it more frictional resistant. There is a possibility of occurring shrinkage and seam puckering after wetting in water and washing the garments respectively. This type of thread is finished by caustic soda solution with tension. As a result, the entire fibres in the threads become round in shape and gain higher strength and brightness. Glaced cotton sewing thread is made by using surface coating on the soft cotton threads. As a result, the threads become stiff, smooth and increase the frictional resistance. It may be made from continuous filament or staple fibres. The strength and stability are comparatively less but more brighten. It has a limited use as a sewing thread but widely used in embroidery work. These types of sewing thread are strong, low cost, good washing fastness and satisfactory elastic properties. It can be washed up to 150°C without any shrinkage. It is widely used due to low cost. At present, polyester thread is widely used in the garments among the synthetic fibres sewing thread. Nylon sewing thread made from hexamethylene diamine and adipic acid. It has not a wide used due to high extensibility because it makes seam puckering after sewing due to shrinkage. These types of thread are used to sew knitted fabric, extensible seam and swimming wear. Aramide threads are not used as a large rate because of more expensive. Aramide threads are used in special cases i.e. fire fighting garments. It is costly. Its commercial name is Nomex. The using of PEFE sewing thread is limited due to the higher cost. It is used for protecting against flame, melt and chemical garments.